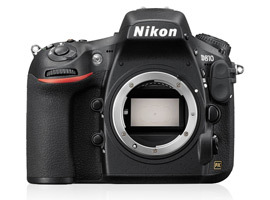 Announced back in 2012 the full-frame 36-Mpix Nikon D800 and D800E version with its essentially zeroed out AA filter could hardly be called outdated but such is the rate of progress, and following the example set early on in the conversion to digital Nikon felt the two models required a refresh. The upgrade is perhaps not unwarranted with Sony using a related 36-Mpix full-frame chip sans AA filter in its highly popular A7R mirrorless model; it’s not too much of a stretch to think Nikon may have felt under pressure to enhance the D800 models. The result is the D810 with the familiar body, the Expeed processor from the D4s with the potential capabilities that brings as well some improved operational features including and the much-anticipated electronic first curtain. The attention-grabbing news though is a new sensor completely devoid of an AA filter. 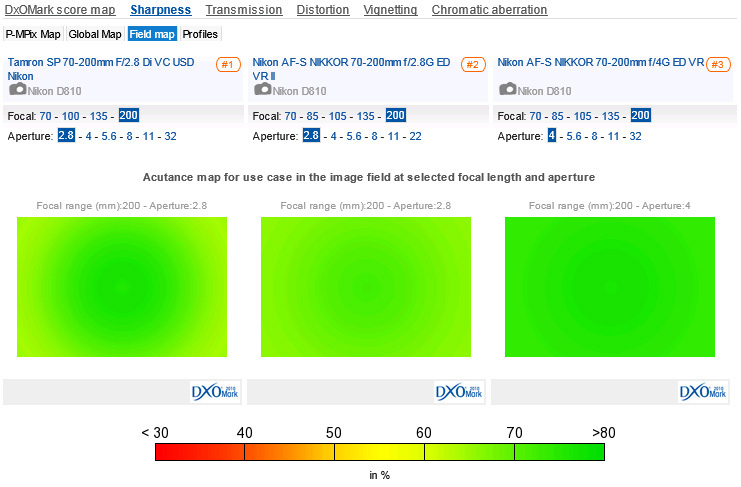 Although it adopts the same pixel count as the previous models, the lack of an AA filter allows the imaging sensor to capture a higher frequency signal and should offer similar or perhaps even slightly better resolving power than that of the D800E. We’ve tested the optical quality of over 100 different lenses on the Nikon D810 to see just how well the sensor performs and if there’s that much difference in the resulting sharpness between it and the tried tested D800E. As always, we’re evaluating the Raw data between the two models, not the in-camera image processing that results in JPEGs and which almost always differs (and usually improves) with every iteration. 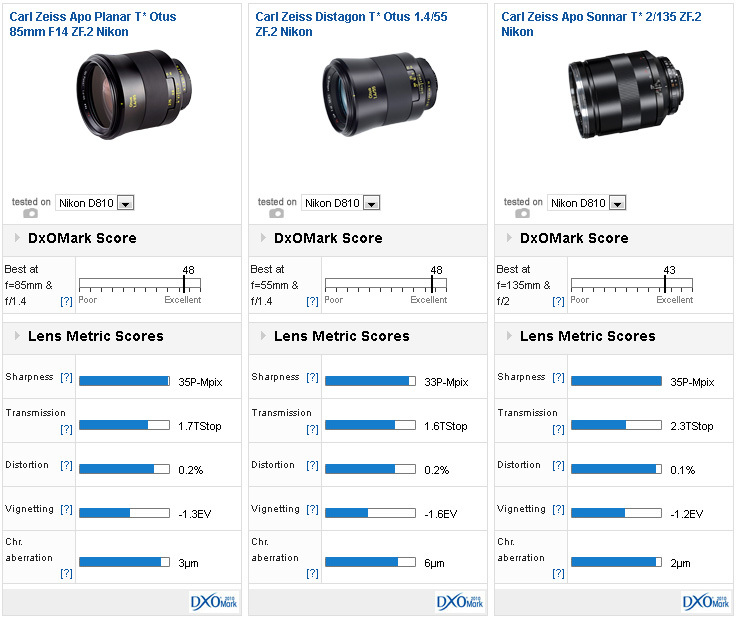 In first place is the new 85mm Otus, which takes the top spot from the firm’s 55mm model in sharpness though overall the two are in fact ranked equally with a DxOMark score of 48 points. 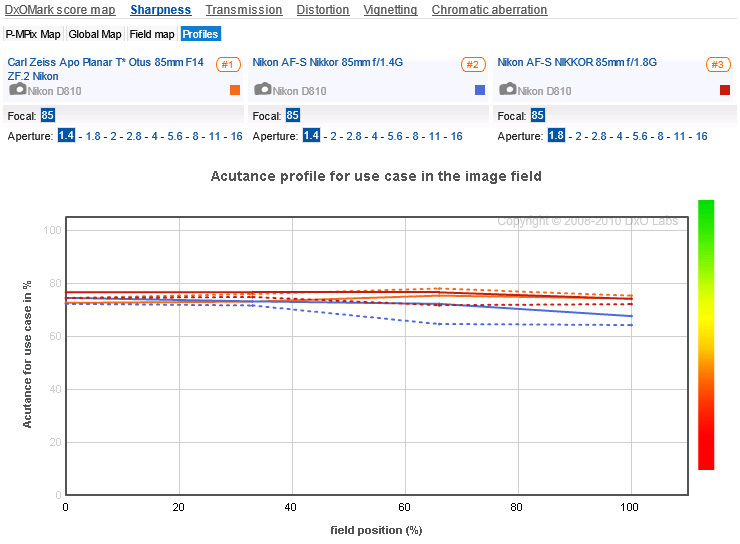 Despite the absence of an AA filter, the Nikon D810 doesn’t outperform the earlier Nikon D800E. In some cases, notably with the Otus models, the D810 achieves a slightly lower overall DxOMark score, although the difference of 1-point (or less, as the scores are rounded) is in fact negligible. However, you’re not likely to choose one over the other based on performance; you either like the focal length (field of view) or not. Despite that it’s worth noting that the 85mm Otus isn’t as sharp as the 55mm Otus or even the Apo Sonnar 135mm at their respective initial apertures – though that is often regarded as a plus for a lens intended for portraiture. That may even count against the 135mm in some respects as that focal length is often chosen for outdoor portraits (though soft-focus filters are available to help with this, if it’s an issue). 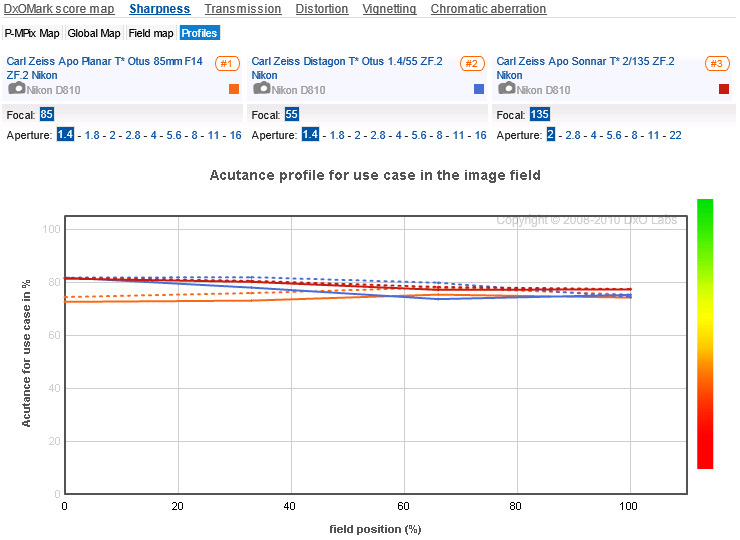 Acutance measured at the initial aperture reveals that the 85mm Otus is slightly lower centrally than the 55mm Otus and Apo Sonnar 135mm. The Zeiss Apo Sonnar 135mm f2 and the Nikkor 200mm f2 come in third and fourth place respectively, although the Zeiss has similnikar sharpness levels as the 85mm Otus, and just as importantly it has practically negligible CA which accounts for its incredible clarity and realistic rendering. The Nikkor AF-S 200mm f2.0G ED VR II is known for it’s outstanding image quality in Nikon circles and it performs very well indeed on the Nikon D810. It’s a bit niche-y though, given the versatility of the 70-200mm f2.8 and close to $6k it’s not going to appeal to everyone. Much the same can be said about the manual focus Otus models although the Zeiss 135mm looks tempting at $1600. The Zeiss Otus is as sharp at f1.4 in the center as the Nikkor 85mm models at their initial aperture and is sharper in the outer field. Stopped down the Otus is slightly sharper than either across the field. Fortunately, Nikon users have a choice of decent 85mm lenses. The more accessible f1.8 model is slightly ahead of the far pricier f1.4 in terms of aberration correction but the latter has higher sharpness levels and users swear by the descriptive properties of the faster model (although in fairness the f1.8 version is close in just about every regard). As we’ve seen before on other models, the latest stabilized, USD (sonic type motor) equipped Tamron SP 70-200mm f2.8 performs very well indeed. It sits at the top of the DxO Mark rankings for zoom models on the Nikon D810, slightly ahead of both the highly regarded Nikkor f2.8 and f4 versions. It is only slightly ahead, although the Nikkor 70-200mm f2.8 isn’t quite so sharp in the corners until closed down a stop. If size and weight are a concern the f4 version is on the one to go for, but you’ll likely want to add the RT-1 tripod collar, which is a $170 optional extra. The Tamron performs well overall, but at 200mm it must be stopped down to f4 for it to match the smaller, lighter (and slower) Nikkor 70-200mm f4. As always it’s worth comparing the measurement data carefully to make comparisons between models. In second place is the $3,600 Sigma 120-300mm f2.8; another niche-y model but one well suited to sports photography. Although it’s not going to match the uniformity across the imaging field of the Nikkor AF-S 300mm f2.8G, it’s a good and consistent performer throughout the zoom range. Tamron feature a second time in the Top 5 with the stabilized SP 24-70mm f2.8. Like the Nikkor version at seventh place, it has a sonic-type AF motor and a saving over that model of around $500 making it an attractive option. There can be little doubt that the Nikon D810 is capable of delivering exceptionally sharp and highly detailed images with the very best lenses, but the results are not dissimilar to the Nikon D800E. 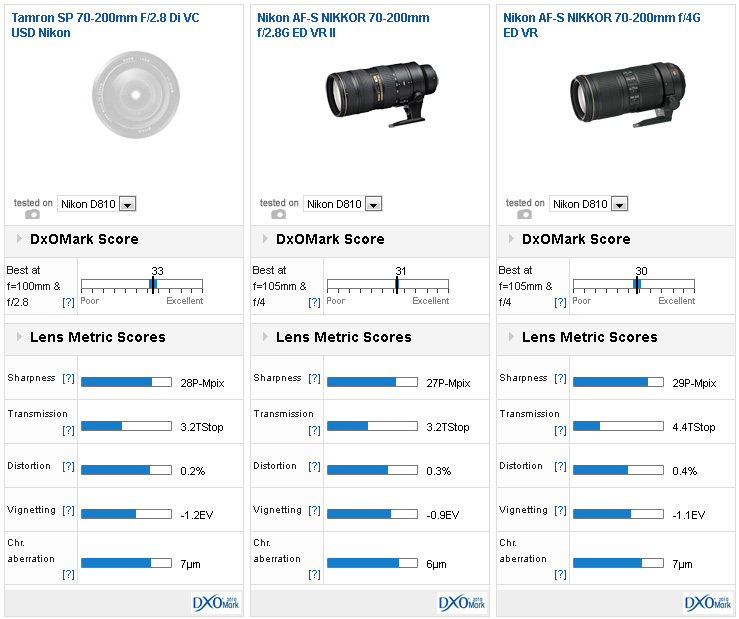 While some of the best scores in the lab were achieved using the D800E (and the Zeiss Otus models) the small difference in DxOMark rating is insignificant between the two camera models. While that’s perhaps somewhat unexpected, there are still plenty of improvements operationally to make the Nikon D810 arguably the most compelling 35mm model currently available for studio and location work. If you have a new Nikon D810 and a favorite lens, we would very much like to hear from you. Please leave a comment below, stating what lens it is and why you like it.